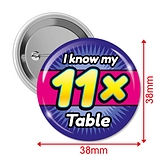 The 11X Times Table button badges are a perfect way to reward and congratulate pupils for learning their tables. 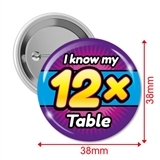 Did you know: In Numerology number 11 is a Master number. A Master number is a double-digit number which also comes from a single root number. Number 11, 22, and 33 are Master numbers.